I am seldom happier than when I am submerged in warm, warm water. Huge bathtubs, steaming jacuzzis, hot springs all make my body and soul go “aaaahhhhh.” The tub may be the only place I know how to really, really relax, in truth. Despite my guilt over the volume of water I’m using in doing so, I’m taking nightly salt baths to help detox my body, relax some of the stress and take time for Not Doing Anything Else (except reading.) Having Enforced Relaxation time is exactly what I need right now. Alas, poor moi. 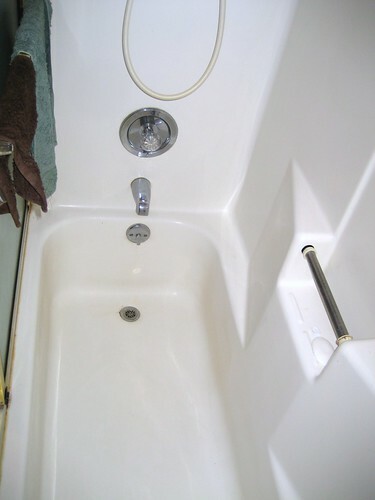 I’m grateful to have a tub at all, though, because there have been houses and apartments which only had the despicable shower stalls. Perhaps someday, amongst the many ambitious projects Mike Neir and I dream about for the house (bigger garage with wood-working area, building a room over said garage, building a chicken coop, rewiring an awesome audio/video system throughout the entire house, et cetera,) we may have to add in turning our two upstairs bathrooms into one big one (or perhaps annexing a closet on either side,) because there is simply no room for a larger tub in my bathroom. Again, Poor Moi! While I’d love a jacuzzi on the deck, I’m not sure I could justify the expense, carbon footprint and extra work to maintain it. I do miss having one, though… the last place I lived in Washington, my house was on top of a hill, and the neighbors/landlords had one on their deck which overlooked the valley below. I spent many an hour in that hot tub, especially in winter. I’m about two-thirds of the way through On Writing, and last night started The Help in bed, too. I have four books going currently, just like the old days, and it feels great. I’m breaking my TV/internet addiction! Ok, you’d never know it by how often I post here, but honestly. It’s true. On a related note, I’m not sure how well the oil cleansing/coconut oil face cream thing is going. I shouldn’t have started them both at the same time, because I can’t tell which may be affecting things. Thus, I’m going back to soap for my face (since that was working smashingly well) and will just try the cream in addition for the drier spots for now. The jury is still out on the shampoo bar – the patchouli smell is overpowering. While I neither like nor dislike patchouli especially, it would have to be laden with a scent I really liked for me to enjoy it in this concentration. Also, the flakes are back only minutes after getting out of the shower and drying off. Feh! I may try a direct coconut oil soak on my scalp. I may try shaving my head. I may try moving to Mars – I’m open to possibilities, one could say. So on that note, bathtime. reading, knitting, sewing–while we have a “garden” tub, we don’t have a large enough hot water heater. (An on-demand heater is on our wish list.) Plus I hate cleaning it. My hubby clippers his hair while sitting on the tub and it’s always full of little hair pieces. 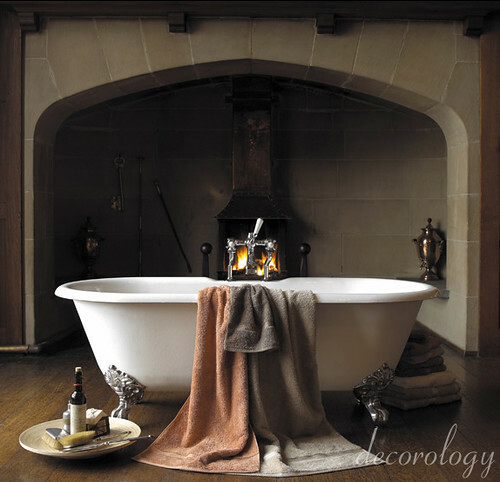 To be honest when looking at our house the first time, the hard wood floors, fireplace, charm and beautiful wood, the bathtub was what sold us! We walked in and found a old large tub with a pedastal instead of the claws. Corrine is a fish and I love fitting properly in a tub. It is a place of great importance in our lives. Our last tub was really pathetic. Makes your tub look big! My condolences on the tub! Besides baths I really find nothing more relaxing then painting. (I know you expected me to say crocheting or needlework!) Both actually very relaxing also, but nothing puts me in the zone more then painting. I am hopeful to someday transform my attic into a studio. Until then saddly no good room/light to paint! Someday again! I would love to take baths but our tiny apt tub is tiny. Even taking a shower in it is a challenge for me and Bart, since we’re both of the seriously-not-small size. I have to bend over backwards just to get my head under the showerhead! If you shave your head, you would thereby revoke your privilege of ragging on Mike Neir for shaving his. Bathes are my cure ALL, aches, emotions, attitude etc. NPH – Those on-demand water heaters are pretty snazzy. When ours dies, I want to replace it with one of those. PHawk – Yeah, I thought about that, too. I reckon it wouldn’t go over well, anyhow! Sounds like are having some sort of skin care allergy issue… You might try Vanicream? No allergens of any kind, company was started by some Mayo clinic pharmacists… target here in MN sells some of their products. Four books at one time. You’re as bad as I am! Thank you so much for visiting me and for taking time to comment and introduce yourself. It’s very nice to meet you. Can you imagine using that beautiful tub, pure heaven! Stopping over from PEAR and French Picnic!